← Pop Quiz: Sports logos! Thanks to all of you who played along on this most excellent Sunday of American style smash-mouth NFL football with the "Design a Fantasy Sports Logo" Pop Quiz Contest! My fantasy team (the Gotham Dark Knights) did fairly well, and has an 11 point lead heading into Monday night's game, where my fantasy opponent has the San Francisco defense going up against my own Frank Gore. My hopes of crushing his hopes and dreams remain high, which makes me a gleeful little bald man. There were some very funny entries, including a few team names I wish I'd thought of. To wit, I thought the Bizarro Spectators, Barsoom Jeddaks, Lorien Arrows, Boston Stranglers, and the Latverian Doombots were all fantastic teams. I might have to expand my fantasy outings next year so I can steal ... er, borrow ... one of those titles, they're just great. I love that cute little Doom hood and face on the heraldic body, that's awesome. I could totally see that on a helmet or jersey. Hell, I'd probably buy one! So congratulations to Myro! Let me know what you'd like for your custom black and white character sketch -- what character and what they should be doing -- and I'll put it on The List. And thanks to all who entered, this was fun! It made for a good distraction while Peyton Manning was ripping my heart out in the first half. All those weapons and he just HAS to throw touchdowns to the two guys on my fantasy opponent's team. Jerk. 14 Responses to Pop Quiz 1 Winner! Lol, The doombot one was my favorite as well. I was hoping Myro would take this one. Say, Jeff, I had no idea the links I was sending you were problematical. They always worked pretty quick for me, and took me to only the desired image. But from now on I’ll follow the ‘Download Image’ procedure you posted, and my apologies for any aggravation. Thank you, thank you. I liked this picture too, it had a good mix of Old European heraldry, and Von Doom megalomania. Actually, come to think of it, I’d kind of like a Doombots jersey myself. Anyway Jeff, since I’m a big Carol Danvers fan, if you could do Ms. Marvel herself, mid-flight, ready for a scrap, I’d appreciate it. 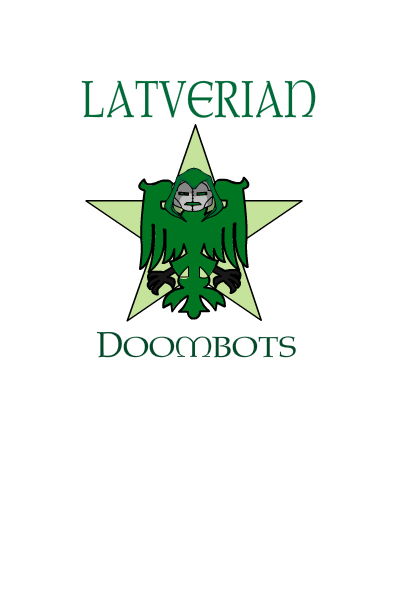 Myro: May I use this image in my online Marvel tabletop game for Latverian Doombots? I think I can wrangle an awesome RPG session based on this idea. @ Skirki: Go for it. Happy to let you use it. You got it Myro, Ms. Marvel it is. I concur with this adjudication. I thought the Doombots had it won the moment I saw ’em. Congrats,Myro! Great design and name. A well deserved win! Yeah, I think Doombots were the obvious winners here. And feel free to borrow the Bizarro Spectators if you like. You got my permission. This was a fun contest. Kind of like a “Speed Draw”… for those of us who can’t draw. @Myro: Congrats, Doombots was my favorite as well. Doom is well pleased with this, “Myro”. He’s done well– he lives…for now. The rest of you? Bah! These were great: I wish I didn’t miss this contest. I still might do a logo for the fun of it.